"I loved being a part of the UHP family. The opportunities I had and the people I met were amazing; and popcorn Fridays were awesome. Thanks for the Honors Oasis and thank you for always being great support for Honors students and providing us with so much." "I'm really happy I decided to join the Honors program. I loved the classes and it has motivated me to complete a thesis project, which i otherwise would not have done." "I have had an amazing time here being an Honors student. David told me something on the first day I met him that i wont forget. 'Being an Honors student is meant to reward you, not punish you.'" "I always looked forward to meeting with my mentor. Everytime I went she reminded me why I decided to attend college in the first place and I always left with a renewed sense of purpose." "I have had an extremely good experience with the Honors Program at SIU and would recommend the program to anyone that asked. I learned about subjects that weren't in my field of study but still found a way to incorporate all of it in to my studies." "I really enjoyed the size (small and more personal), diversity of subjects, and quality of teaching instructors that the Honors Program offers. I was better challenged in these classes unlike most of the core classes." "Every mentor I met with was extremely helpful in guiding me towards my end goal and ensuring that I was keeping up with all of my classes and extracurricular activities. They were the biggest support during my undergraduate career." "My favorite part was being able to register for classes before anyone else. I always got into the classes I wanted." “When I joined the Honors Program as an incoming freshman I thought it was just going to be something that would look good on my resume. However, I’m junior now and as the years have progressed I have become more and more fond of the program. I have thoroughly enjoyed every class that I have taken and I think it is a great opportunity. Today I was reading over the email with the new classes for next semester and I was astounded. I want to take almost every single class! I’m especially excited about the Walt Disney class!" "The Honors Program has been a huge part of my college experience. Having the opportunity to meet and converse with outstanding professionals such as Story Musgrave, David Levy and Garrison Keillor is a source of inspiration and encouragement in my own pursuits." "The University Honors Program has opened so many doors for me. I never would have applied for the USA Today All-USA College Academic Team without their guidance. They truly care about providing us an advantage for our future." "The University Honors Program has been an indispensible aid in my pursuit of major scholarships. The faculty are skilled, knowledgeable and tireless in their efforts. It is because of their focused, goal-oriented work that I was able to secure the Barry M.Goldwater Scholarship. I cannot express the depth of my gratitude for their steadfast belief in my abilities and ardent desire for my success." "Honors classes have allowed me to explore worlds that I did not think were possible to me. I have not only learned about how to be a better student, but a better and more well-rounded person." "My experiences with the honors program will be some of my best memories of my college experience." "Through the SIUC Honors Program, guest lectures, breakfast meetings and opportunities to meet diverse academic luminaries, I have had significant exposure to academic figures that would otherwise have been unavailable to me. Thus my academic experience has been enriched and has equipped me with strong confidence in knowing that I will complete post-graduate degrees and enjoy a meaningful career. I wholeheartedly recommend participation in the SIUC Honors Program." "The University Honors Program is an excellent opportunity for students to enhance their college experiences. The classes offered through the Honors Program are not like any other classes on campus. I have learned more from my honors classes than any other classes." "University Honors Program helps me build on my accomplishments and inspire me to climb a little higher and stretch the boundaries of my imagination." "I think the honors program provided a chance to be exposed to some interesting classes instead of just average core. It made going to class an enjoyable experience. Working for my Honors thesis has also really prepared me for what to expect in graduate school." "The honors program is a great aid to students. Lots of scholarship opportunities and interesting classes, I recommend it to any student." "I have been able to explore many new areas of study that I would have never thought about otherwise. My analytical and writing skills have improved greatly with each of the courses I have taken. I also enjoy small class sizes because I am able to work closely with the professor and participate in class discussions." "University Honors Program has enabled me to gain a wealth of information that is above and beyond what you can get in a normal class." "Some of the honors professors I've worked with have been the best and most thought provoking teachers I've ever had." Honors students include Fullbright fellows, Barry Goldwater, Morris Udall and Rhodes Scholars. The Honors Program advises and helps students apply for these competitive awards. Read more. 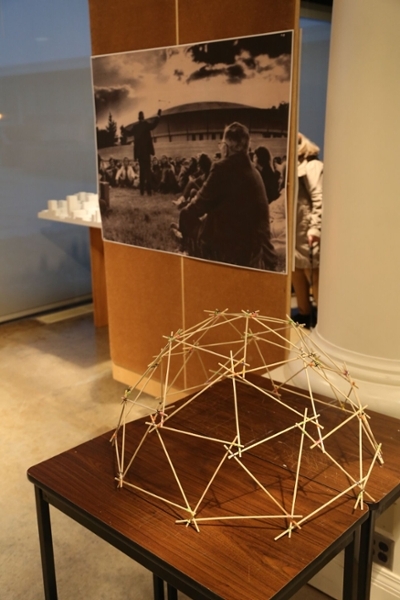 February 5-9th, 2019: Celebrating the 50th anniversary of Buckminister Fuller's Operating Manual for Spaceship Earth legacy: Read more. UHP is committed to enabling our best and brightest to reach their utmost potential. Students from all academic disciplines said that the UHP has been the highlight of their academic careers. We hope you will consider making a tax-deductible contribution and “invest in excellence” at SIU. More information about contributing can be found here.